The Allentown Collection gets it's name from Allentown Pennsylvania, the town from where it was discovered , or should I say rediscovered, in 1987. 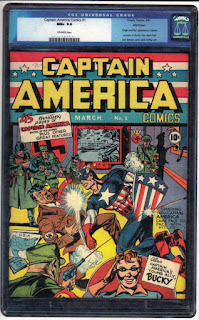 Although it's a relatively small collection of 135 comics, it boasts some of the highest grade key issues from the Golden age there is. Some say that the nicest looking copy of Detective Comics #27 is from this collection. I guess I'll have to take their word for it because I'm pretty sure that I will never lay eyes on it. I'm not sure if this copy has been graded or not. If it has been there's either no information on it or it hasn't been available on the market for a while. Most likely, the owner has it stashed away in a nuke proof vault behind a wall of lasers and robots with machine guns. The original owner bought all of these comics right off the rack in the late 30's to early 40's when he was a young lad, which is one of the criteria of a pedigree. Many years later, he rediscovered his collection in his mothers closet as he was cleaning it out. He was sure that she had thrown them out long ago, but there they were. Eventually the collection was bought by James Payette and Stephen Fisher for the small price of $70,000. That may sound like a lot, but when you think about how much the collection is worth, 70 grand really isn't that bad. At least for how much it's worth today. I'm not sure what these comic were selling for in the late 80's. Much less than they are now I'm sure. With this collection being so small, it's very hard to find any copies from it on the market. Occasionally you will see one pop up on sites like ComicConnect or Heritage Auctions. If you do happen to find one, you should expect to call your bank and ask for a loan, because they are going to be expensive. 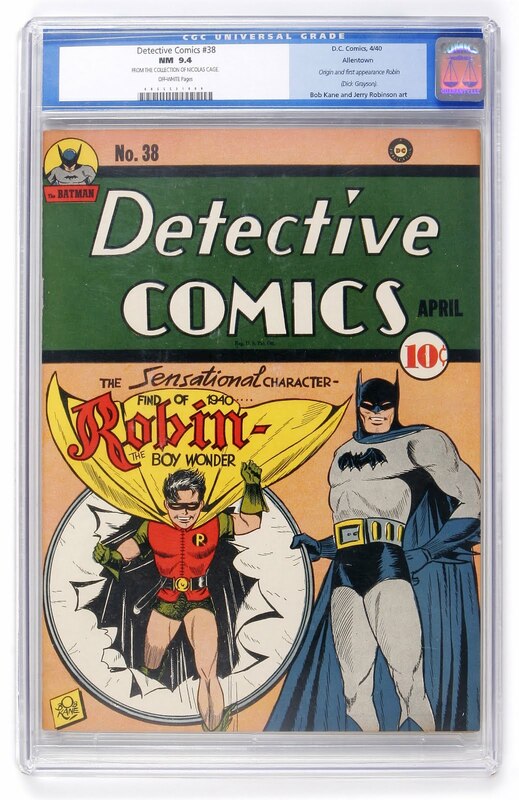 A couple highlights of the comics that have already been graded in this collection are, Detective Comics #38 CGC 9.4 (first appearance of Robin), and Batman #6 CGC 9.6. The last comic doesn't have much going for it in terms of first appearances or any other key issue status, but it is the highest graded copy of Batman #6. And the Allentown Collection copy of Detective comics #38 has more than the first appearance of Robin. 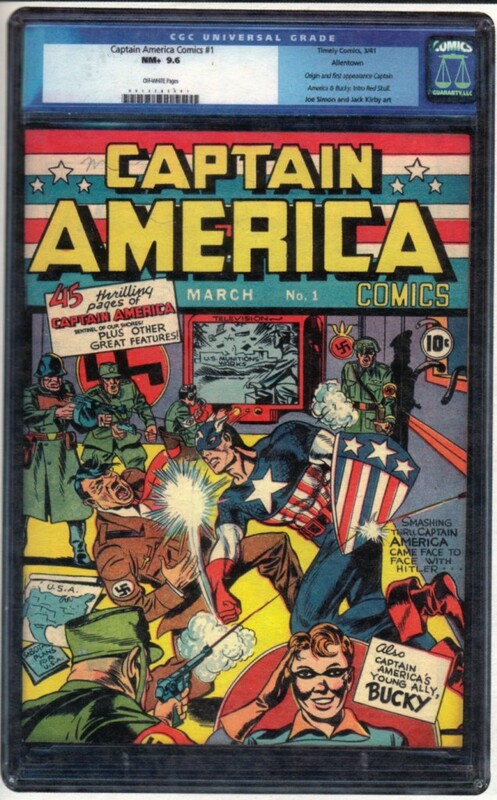 It was also in the personal collection of actor and comic fan Nicolas Cage, and is stated so on the CGC label. There seems to be a little bit of conflicting information with a couple of books. Like a copy of Captain America Comics #1. In my research, I've found a few sites with the info of a 9.8 copy and a few sites with info on a 9.6 graded copy. I even posted a picture of the 9.6 copy at the top of this page. But, when I checked it out on the CGC census, there were zero copies graded at 9.6, as you can see in the picture to the left. There is one copy graded a 9.8 and two graded a 9.4, with one of those being restored, but no 9.6's. Has there been any news of a counterfeit copy out there? If anyone knows more about this, please let me know. It would be greatly appreciated. Copies from this collection don't come up for auction very often, but I've included links to sites that might have some available. There were no copies for sale or auction at the time of this writing, but you can check again occasionally to see if anything new is available.